My first Wes Anderson movie was The Royal Tenenbaums – and I wasn’t a big fan of it. To some extent that may be because I wasn’t yet used to Anderson’s particular cinematic idiom, but at least as much as that I think it’s that Anderson himself was still looking for that idiom. There’s a lot in the film that looks instantly familiar, but my main problem was the way it tried to blend the arch stylistics and Andersonian characters we’ve become familiar with on the one side and poignant drama on the other. There’s one scene in particular, a suicide attempt late in the film, that felt to me like Anderson was flipping a switch: one moment the film’s characters were cartoons, the next we were supposed to take them seriously as characters with depth and genuine suffering. I sat there seeing what Anderson was aiming at, and the scene is effective in itself – but I wasn’t buying it. From an atypical variety pack to a covert one – the Variety Pack that dares not speak its name. I recently celebrated my birthday, which I usually follow with some hedonistic binge buying of DVDs and Blu-rays. We’ve since watched two of the films I’ve bought, namely the indie sci-fi-tinged drama Another Earth and Wes Anderson’s latest Andersoniad, Moonrise Kingdom. Let’s start with the one I’ve seen more recently, Moonrise Kingdom. I have an ambivalent relationship with Anderson’s films; I find his striking, hyper-arch style fascinating and irritating in equal measures. Having said that, I loved The Fantastic Mr Fox, and I have a lingering suspicion that I’ll come to feel similarly about Moonrise Kingdom. On the surface it very much does what all his films do: tell arelatively simple storiy that is tinged with melancholy using ironic artifice in the presentation. Anderson’s style felt too much like a pose to me in The Royal Tenenbaums, hampering the sadness because the form seemed to whisper constantly, “My, aren’t we being ironic and self-aware about all of this?” There’s something more felt, more balanced in Moonrise Kingdom‘s performances, though, especially those by the two young leads, which renders the sadness much more effective and credible. It no longer feels quite as much as if the director is constantly putting the air quotation marks of irony around everything in his tale, even though the film is stylistically pure Anderson. As a result, Moonrise Kingdom is both a typical, dollhouse-style Wes Anderson confection and a convincingly sweet, touching childhood romance, without the two being at odds with each other. The change is a subtle one – from stills, and probably from the trailer, this will look like any and every film by the director – but it’s definitely worth checking out for those who were ambivalent about his earlier works. Another 2012 film that I’d heard good things about, Another Earth, turned out to be more of a disappointment. It attempts to marry a relatively generic drama premise (a young woman destroys a man’s life when she, drunk and distracted, crashes her car into his, killing his wife and child) to a sci-fi high concept: one day, a second earth appears, visible from our planet, and get this: that planet is identical to ours in every way. What a weird, wasted premise. The film later goes back on it, but for most of its duration we’re made to believe that this other earth is identical to our own, the people on it are identical to us. It’s a mirror image – but what good is a mirror image if it doesn’t allow us to contrast what we believe we will see with what we actually see? 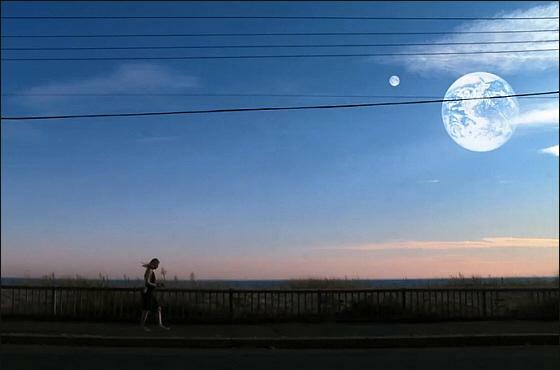 Another Earth‘s mirage in the sky is a concept that’s used to surprisingly little effect, with little reality for much of the film. In a story that is about regret, wouldn’t a more intriguing move be to make this second earth a constant reminder of “What if”? Since the film has already suggested that things on this second world are identical to ours, it’s not a mirror so much as a copy. Except, in the film’s last fifteen minutes, there’s suddenly the suggestion that while the two earth’s were identical, this synchronicity was shattered when Earth 2 was first glimpsed, moments before the crash that sets the story into motion. So why not have this as the premise to begin with? For more than an hour, the second earth is a visual, a concept, but a vague, abstract one, a pretty but pointless intrusion on a fairly standard drama about guilt, regret and second chances. Earth mark 2 only comes into focus for the film’s ending, coming across as a half-baked idea in serious need of a rewrite. What doesn’t help is that the film is too languid, too slow, to keep the viewer distracted from some uncomfortable questions. The main character, before going to prison after the accident that kicks off the plot, wants to go to MIT. She is in love with the universe and its mysteries. Yet the second earth makes not a jot of sense: it starts off small, then gets bigger and bigger, so doesn’t that suggest it’s a threat to earth, a more familiar double of Melancholia‘s eponymous planet? How can such a planet be identical to ours in every way if it doesn’t share our orbit, miraculously appears one day and then comes closer, growing ever bigger in the sky? These questions, to be quite honest, should be absolutely irrelevant – von Trier’s film couldn’t have sustained such science-minded inquiries either – since the celestial doppelgänger ought to be relevant in thematic terms, not scientific ones, but Another Earth fails to make the sci-fi element resonate with its theme. The big blue bauble just hangs there while the fairly predictable, though well-acted, earth-bound drama ensues. Note to the writers: if your main story conceit is irrelevant to the story you’re telling for 80% of its running time, perhaps it’s not that good an idea in the first place. Think about it.